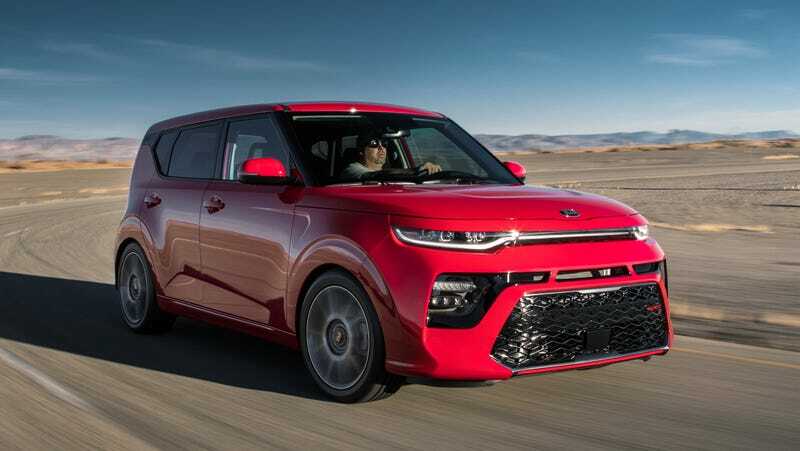 The 2020 Kia Soul is now in its third generation, a fun and practical if not exactly Sporty subcompact crossover that will go on sale next year. It’s for the sensible consumer with taste, someone who wants something that’s reliable and looks cool and that isn’t a Chevy Trax. Kia unveiled it this afternoon in L.A. The Soul will come with a 1.6-liter inline four cylinder, which is turbocharged and makes 201 horsepower and comes with a dual-clutch transmission, or naturally-aspirated a 2.0-liter inline four, which makes 147 horsepower and can come with a manual, according to Kia. They did not announce pricing, but it will probably be priced in line with the current Soul, which starts at $16,490 and has the same engine options. The bigger news is the electric Soul, which Kia says will have a 64 kWh battery, which Inside EVs estimates could have a range of 240 miles, or 129 miles more than the current electric Soul. Big if true, as Kia says that the EPA-estimated range is still being calculated and won’t be available until next year. The electric Soul will make 201 horsepower and 291 lb-ft of torque, according to Kia. Like many other electrics, it will also have smart braking, which regenerates power and will allow for one-pedal driving. The big change for both the electric and the ICE versions is styling, which includes the following “new” details, per Kia. Which, whatever, great! All I know is that it looks good, and retains much of its quirkiness. Further, my teen nephew says that, in addition to Beetles, if him or his buddies see a Kia Soul on the road it is cause for someone to get punched. Which, he may not know it yet, is as high a compliment as any.